Over the last two weeks the team has been busy working with journalists from BBC Look East, Farming Today, the Eastern Daily Press, Mustard TV and Radio Norfolk. With Land and Water Services on site there was much to talk about and share with the public. As well as celebrating the first geotubes being filled with sediment from the broad, we were also proud to show off our plans for the Nature Trail before it reopens in April. 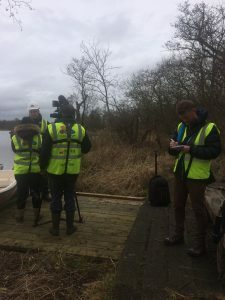 In spite of Storm Doris, we had two fantastic days on the Nature Trail and Hoveton Great Broad with the press, filming the diggers from Land and Water in action. Thank you to Anna Hill from BBC look East, Chris Hill from the EDP and Lauren Hewitt at Mustard TV for all their hard work.